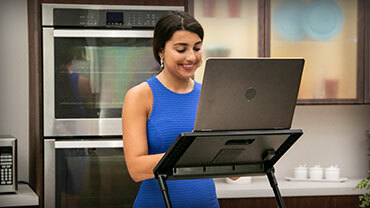 Finally, you can comfortably use your laptop anywhere, thanks to the portable & adjustable Air Space™ desk. Take Air Space™ to the office, then bring it home to use in the kitchen - folds flat to store easy! Tired of sitting at work all day? You just want to stand so the pain goes away. Well, now you can with Air Space™ laptop desk, the new adjustable desk that holds your laptop in the position you choose. READ FULL DESCRIPTION Chairs can cause you to slouch so your back gets stressed. Now you can stand and give your tired back a rest. Say goodbye to awkward typing in bed. When you use Air Space™, snuggle in with the perfect position. Stop struggling to work everywhere you sit. Air Space™ puts your screen where it is easy to see. Why are you still constantly changing positions on the floor? With Air Space™ desk, there's no need to do that anymore. The secret is in the custom fit adjusters that allow you to position it exactly where you want it. The sturdy tray locks in at the perfect position. And the expandable lip holds your laptop firmly into place. There's a built-in whisper-quiet fan beneath the tray cooling your laptop. Comfortably work on your device for hours without overheating. The entire Air Space™ desk folds flat for easy storage. It's ultra-portable. Use in the office to stand at your desk, then bring it home to surf the web in your kitchen. Air Space™ can hold just about any device. You can even use it in the car! And Air Space™ isn't just for laptops. Try it as a TV dinner tray, writing table, and table holder. Every device, big or small, Air Space™ desk can hold almost all! Get your Air Space™ desk now for only $39.99 plus S/H. Upgrade to receive the Deluxe side mount pad that's perfect to hold your mouse. But wait! Double your offer and receive a SECOND Air Space™ desk and we'll include the LED light. Just pay a separate fee of $19.99. Hurry - this offer won't last long. Order now! Easily Store Air Space™ When You're Not Using It - Completely Folds Flat & Is Ultra-Portable! Check out these other great products by Air Space. OFFER: Get your Air Space desk now for only $39.99 plus $9.99 S/H. Upgrade to receive the Deluxe side mount pad that's perfect to hold your mouse. But wait! Double your offer and receive a SECOND Air Space desk and we'll include the LED light. Just pay a separate fee of $19.99. Hurry - this offer won't last long. Order now! GUARANTEE: Your satisfaction is 100% guaranteed. If you are dissatisfied with your Air Space? for any reason, simply return the product within 30 days for an easy refund of your purchase price, excluding shipping and handling. See our return policy for more information. Exceptions may apply.